We are all for soothing boat rides through villages of frightening adorable dolls singing songs of world peace, but sometimes we just want something a bit more...thrilling. Disney World may be a family destination, but in each park you'll also find things that are guaranteed to get the adrenaline pumping. Sound like something you might be interested in? 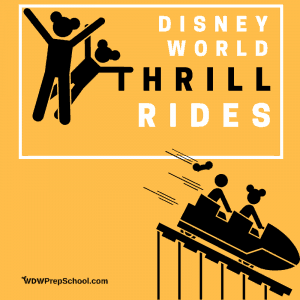 Here's where you'll find the Disney World thrill rides in each of the parks. All of the rides listed below have height restrictions which are strictly enforced, so don't try fudge your child's height. Disney knows all the tricks. Some of the attractions below may make you motion sick, so if you love the thrills but the thrills don't love you, you'll want to do some advance planning before you get queasy. If you are traveling with somebody that is too small to ride, make sure you take advantage of Rider Switch. Rider Switch makes it easy for everybody who is tall enough to enjoy the Disney World thrill rides. 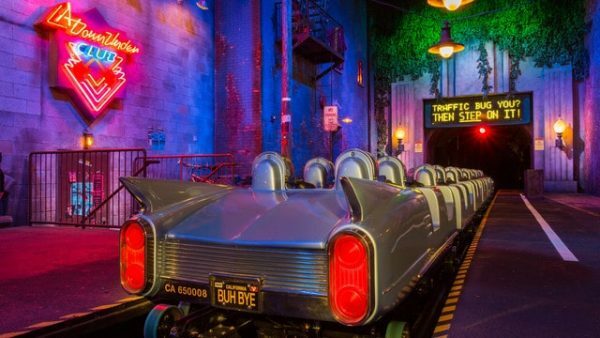 Even though these are thrill rides, in nearly every case you'll be able to take your bag with you on the attraction so no need to worry about that. If you have a child that is new to being tall enough to experience the thrill rides listed below, here are a few tips that might help. Prepare kids ahead of time by watching ride videos. YouTube is a fantastic resource. You'll find point-of-view videos for every or nearly every attraction at Walt Disney World. Watching the attractions ahead of time can help ease some of the anxiety first-time riders might feel. Don't start with the most intense thing first. 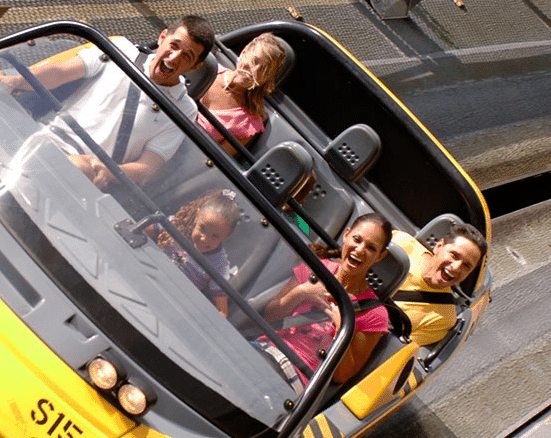 Ease into the world of thrill rides by trying some of the less intense attractions first. Encourage kids to try something new but don't force it. Yes, you know your child best and you may know all the way to the tips of your toes that they would "love" something if they just tried it, but forcing a crying child to ride something is often not a good idea and it likely won't make happy memories. Be prepared to revisit a ride. Even adults may find that for some attractions it sounds like a good idea up until the point you actually have to walk inside. If you get close but your child decides at the last minute they changed their mind, have a plan in place for that. Often times, though, a person that "almost" walked inside summons the courage later in the day (or trip) so if your plans allow it, if that time comes when somebody says "I'm ready" give it another try! Mountains are the theme for the thrills in this park: Big Thunder, Space, Splash, and whatever the name of the mountain where the Dwarfs are mining is called. They don't call this one "the wildest ride in the wilderness" for nothing. Expect some sharp turns but no super high drops on this coaster. It's a bit bumpy at times but not as bad as its cousin, Space Mountain. Get ready to blast off into space on this classic indoor coaster. Adding to the thrills of this nearly totally in-the-dark ride are the glimpses of the tracks you'll catch as you whiz by. This coaster is known to be a bit rough. So, make sure the fillings in your teeth are secure before climbing aboard. 99.8% of this attraction is a peaceful, floating journey through lovely scenes speckled with silly animal animatronics. 0.2% of the ride are a couple smaller drops and then one heart stopping "OH MY GOODNESS I AM GOING TO DIE" drop followed by a dousing of water. But don't worry, you get just enough time after the final drop to clean off your glasses and quiet your nerves while you listen to one last song before unloading. The newest of the thrills at Magic Kingdom, Seven Dwarfs Mine Train is as smooth of a ride as Space Mountain is rough. And, like Splash Mountain, this is another thriller that tries to calm your fears with animatronics. Again, no super-high drops here, just some mild drops, tight turns, and classic Disney character fun. Currently home to 2 moderately thrilling attractions and 1 soon-to-be thrill ride, adrenaline junkies have a couple options here to make them happy. Original versions of this attraction made enough people ill that a milder version was installed. That should tell you all you need to know about this ride. Those looking for excitement will want to check out the "Orange Mission" (not the "Green Mission"). And, if you have a sensitive stomach, you may want to sit this one out. There is a lot to love about Test Track and you don't have to be a car junkie to enjoy this attraction. The thrills here come primarily from the outside loop where you accelerate quickly on banked curves, but even some of the stuff inside might make you go "Wheeee!" Just now starting to peek out above the construction walls are signs of the new Guardians of the Galaxy attraction that is coming to Epcot. This giant of a ride has been confirmed to be a coaster which means Epcot is getting a new thrill ride. The exact date of completion hasn't been released, but most people think it will be open by 2021. Want to stay up to date on the construction at Epcot? Check out our Epcot Updates post for more information. The 3 thrillers here all provide vastly different experiences making Hollywood Studios a great place to go if "danger" is your middle name. Picture Steven Tyler and Aerosmith singing loudly into your ears. Now, picture Steven Tyler and Aerosmith singing loudly into your ears while you are upside down. If that sounds like an awesome time to you then this is something you'll definitely want to check out. Rock 'n' Roller Coaster is totally indoors, has a killer launch, and pairs the loud rock sounds of Aerosmith with a silky smooth coaster-ride. Put all that together and you have one of the most intense attractions on Walt Disney World property. From the creepy basement boiler room to the elevator with a life of its own to being dropped - and then shot back up again - over and over, this ride has it all. Not for the faint of heart, but a definite "must do" if thrills are what you are after. 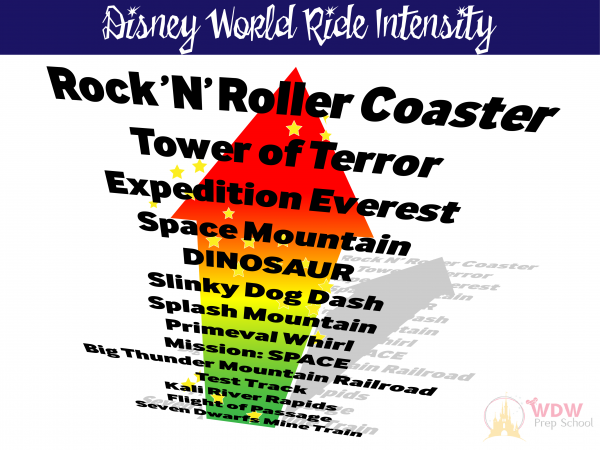 It feels almost silly to follow-up a section on something as intense as Tower of Terror with something like Slinky Dog Dash, yet here we are. Hollywood Studios' newest thrill ride, this adorable coaster is as fun as it looks. With a couple of launches milder than those of Rock 'n' Roller Coaster and dips a bit more intense than those of Seven Dwarfs Mine Train, this coaster is a good "in-between" option for people working their way up to the bigger thrills. Animal Kingdom may seem cozy and organic with all those plants and furry animals, but it has several attractions that are anything but "mild." Flight of Passage is like a freaky cross between an amped-up version of Soarin' and Mission: SPACE (if Mission: SPACE had banshees). Like the other 2, it's a simulator attraction, and while it is known for making people motion sick, its breathtaking beauty, unique ride "seat," and hyper-realistic optics make it a must-do for any thrill seeker. If I had to describe DINOSAUR in 1 word it would be loud. If I had to pick 2 words, it would be terrifyingly loud. Disney's mastery of realistic animatronics take you back into time where your survival depends upon avoiding becoming dinner. This one can be a bit rough, and did I mention it was loud? This coaster is insanely unique and even though there are no inversions, the portions where you go backwards almost feels as if you're upside down. 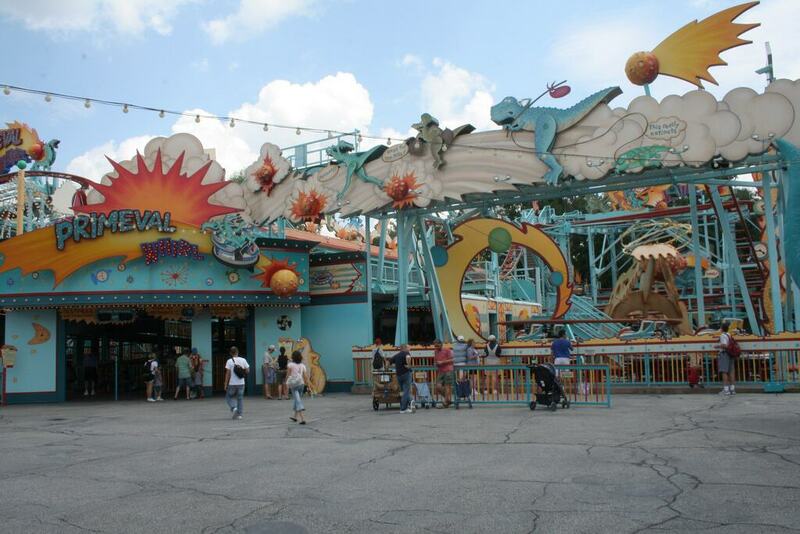 Everything about this attraction screams: thrill. Well, everything except for the Disco Yeti (but rumors are always swirling that he's going to be fixed soon). If adrenaline is what you run on, you can definitely fuel up here. "Surprisingly short but not lacking a punch of fun" is a good description for Kali River Rapids. Prepare to get soaked. This is the one thrill ride where you'll want to store your stuff in the lockers found just outside the entrance. Not-so-lovingly nicknamed "Primeval Hurl," this attraction has drops. And spins. And g-forces that make you regret that snack you ate before you got on. This one is also pretty rough, so prepare yourself if you decide to give it a try! Ranking these attractions in order of intensity was downright tough. 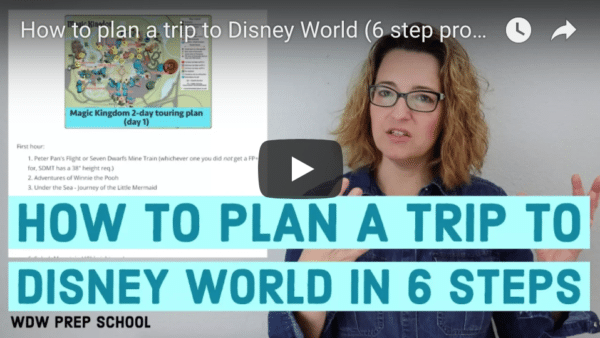 What makes an attraction a "thrill" ride? Is it the drops? The darkness? The g-forces? The surprise elements? Suffice it to say we struggled with coming up with an order to these 14 attractions that Disney classifies as "thrill rides." Think we got the ranking of the Disney World thrill rides wrong? Tell us how you'd rank them in the comments. Who knows, if your argument is good enough, maybe you'll change our minds! I was surprised at how mild Big Thunder was. It brakes when you think there’s going to be a drop. It’s bumpier than Mine Train, but less intense, I think. Flight of Passage made me so sick, though not bad as the GREEN version of Mission Space. So that to me makes them more intense. Why is everything so uncomfortable? I agree with most of your list but is Mission Space a thrill ride? I just find it a very odd non-thrilling experience. Never felt sick on it just felt odd but certainly walked off every time feeling anything but thrilled. I literally thought I was going to die on Mission Space before they added a mild version. NEVER AGAIN. My stomach cannot handle sudden drops like Tower of Terror, so that is the most thrilling to me and you won’t catch me on it ever. That being said, my ‘must-do, absolute favorite’ ride is Rockin Roller Coaster!! I am feeling pretty proud of myself since I have become a wimp on most ‘thrill rides’ and roller coasters in my ‘later years’. Thanks for the run-down! Can’t wait to ride Slinky Dog Dash soon!! I love all the rides on your list. By far the scariest thrill ride in Disney is Summit Plummet at Blizzard Beach. 120 foot drop with just your body and the water. We love waterparks and have been to Blizzard Beach twice, but still don’t have the courage to do it. Oh, and by the way, my daughter, who loves every other thrill ride at WDW, can’t endure Dinosaur!, which I do and laugh off. This sort of ranking is really meaningless, because it doesn’t take into consideration the nature of the thrill. For instance, if you’re afraid of heights, Big Thunder is easy because it never leaves the ground. Flight of Passage, on the other hand, is undoable because it feels like it’s in the air. My daughter famously reassured me that Tower of Terror was “just an elevator.” “It goes up and down. Ever been in an elevator?” she asked; “Then you’ll be fine.” Almost died of fright–she doesn’t have a fear of falling, I do. We were just there last week. The Slinky Dog Dash is a super mild coaster and belongs lower on the list! It is a smooth ride and even easier than Big Thunder Mountain and 7 Dwarfs Mine Train.